Vintage poster expert Kirill Kalinin, is the founder of AntikBar. His passion for original vintage poster art and graphic design started in 1993 when he saw the posters at The Great Utopia: The Russian and Soviet Avant-Garde 1915-1932 exhibition at the Guggenheim Museum in New York. After collecting for several years he decided to become a dealer. Here he reveals why collectors of ski posters continue to be drawn to the slopes. Skiing is one of the most popular winter sports and it’s not difficult to understand why. The thrill of speeding down a mountain, simply meandering down gently or just enjoying a drink on a terrace near the slopes is very appealing. The clean, fresh air and beautiful white snow glistening in the sun under a blue sky in a picturesque mountain setting leaves a lasting impression and can become highly addictive. In the early days, skiing was a very exclusive sport, available only to those who lived near the mountains or could afford the luxury of a costly travel, basic equipment and ski guides. Over the years the sport has become more accessible while still managing to retain a glamorous allure. This stylish and romantic notion of skiing was particularly well captured in posters printed to advertise winter resorts. Posters were the only way to reach an audience on a global scale up to the 1960s. Printed by the government tourist agencies, railways and individual resorts, these advertisements were sent out to travel agencies and embassies worldwide, to be displayed on the walls and largely discarded after use. Luckily some of these artworks survived and they remain as eye-catching today as they were all those years ago, still beaming the joy, glory and fun of winter sports and pleasures of an alpine holiday. Colourful, dynamic, glamorous, and stylish, posters make for an excellent investment, ideal for decorating chalets and, back home, act as a stunning reminder of a memorable trip. The popularity of certain resorts, and the fact some areas are more desirable and expensive than others, is reflected in poster prices. 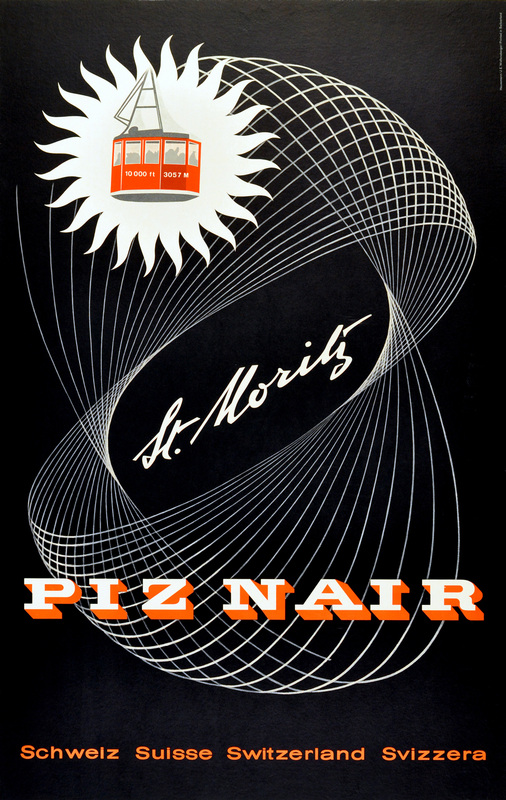 Swiss posters remain the most valuable, especially for destinations like St. Moritz, Gstadt and Zermatt. 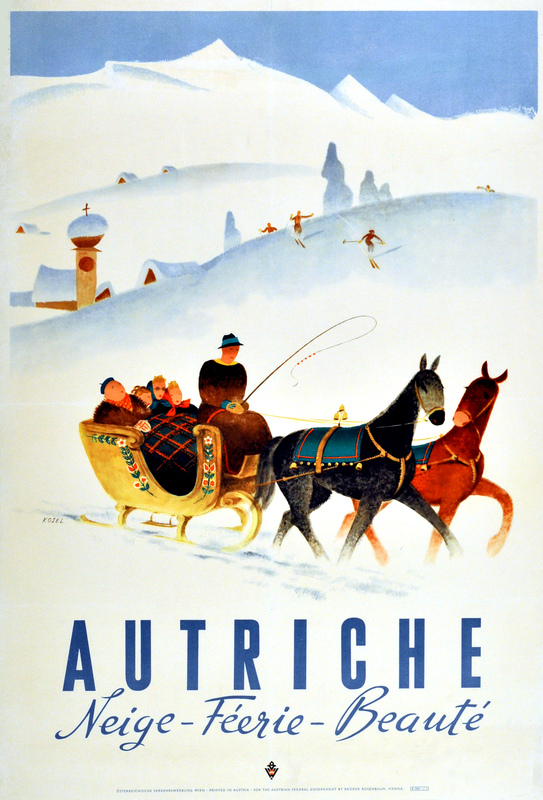 France is closely behind with steady demand for vintage posters featuring Chamonix, Corcheval and Mont Blanc. Austria closes the top three with a rising demand for general skiing posters and destinations like Zug being much sought after. On average, if you were to look at the results of the annual ski poster sale at Christie’s, prices have risen nearly 30 percent per annum in the last nine years. 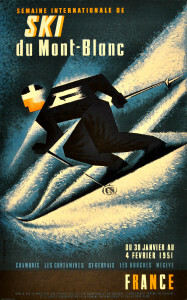 Ski poster prices are also influenced by the artist and style of the artwork. Demand for Art Deco and mid-century posters remains strong as they manage to capture the glamorous side of the sport at its best and display well in modern interiors. Posters designed by Emil Cardinaux, Martin Peikert, Edouard Elzingre and Roger Broders, among other ‘big name’ and great ski poster artists, usually fetch impressive results at auction. Condition is an important factor in price appreciation although minor defect can be skilfully mended by a professional restorer. It’s always advisable to buy from a reputable dealer or auction house. Whether you’re looking for one or two posters to decorate your home, or you’re considering starting a collection, posters are an enjoyable investment that will bring you aesthetic dividends on a daily basis. Posters that feature trains or planes and mountain scenes also appeal to a wider collector’s market and tend to be in good demand. Overall, try focusing on strong stylish designs by well-known artists. These posters are more likely to continue achieving high prices in the long term. The entry level prices for original vintage posters start at around £300, a cost that is comparable to a skiing holiday; the difference being that you can enjoy your poster hanging on your wall all year round. This 1960s’ Swissair Skiing Winter Holidays, which costs £375, and features ‘the world’s greatest ski lift’ would be a good level entry design. 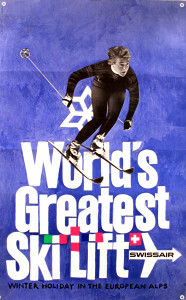 Designed by Max Schneider and printed in Switzerland, it shows a skier speeding down with the flags of Switzerland, Italy, Austria and France incorporated in the text. 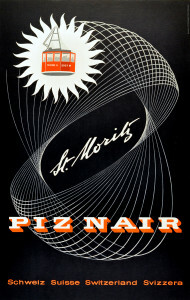 An original vintage poster for the Piz Nair skiing area in St Moritz, Switzerland – Schweiz – Suisse – Svizzera. It features a fantastic modernist design with a red cable car (10,000 ft / 3057m) in front of a stylised sun with the text between and below spiral lines. The Piz Nair mountain overlooks St Moritz and lies in the Engadin ski region, which hosted the alpine skiing events during the 1948 Winter Olympics. The artwork is by Wolfgang Hausmann. Farblithografie, Druck J.E. Wolfensberger, Zurich. Very good condition, backed on linen, c. 1950, size 64 x 101cm. Another original vintage poster for the Semaine Internationale de Ski du Mont Blanc, du 30 Janvier au 4 Fevrier 1951 (International Skiing Week, Mont Blanc, 30 January to 4 February 1951). Chamonix, Les Contamines, St Gervais, Les Houches, Megeve. 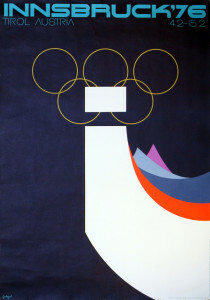 It features the dynamic image, in shades of blue and white, of a skier racing down the slope wearing the number 1. Good condition, restored, creases and tears, backed on linen. 1951, artist: E Lancaster, size 101.5 x 64cm. Original vintage poster for Austria reading Autriche: Neige, Feerie, Beaute: (Austria: Snow, Enchantment, Beauty). By the Austrian artist, Hermann Kosel (1896-1983), it features a snowy scene with people wrapped up warmly with blankets riding in a traditionally-decorated sleigh pulled by two horses. The background shows skiers, a church spire and snow covered chalets on the mountains. Printed in Austria, for the Austrian Federal Government by Bruder Rosenbaum, Vienna. 1947, size 94.5 x 63.5cm.